equal Sour Cream Containers!! I swear these are the easiest things to make for favors! 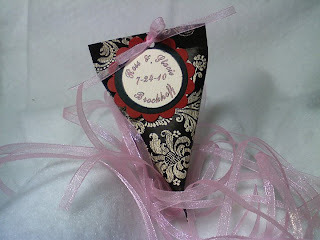 And probably the most inexpensive of the paper crafting favors. One of the ladies on staff of the agency I work for is getting married this month and I told her for my wedding gift to her I would make favors. She had seen the sour cream containers before and did like them. Stacie's wedding colors are black, ivory, red and pink. When Linda and I were in Tulsa on Thursday I looked at Michaels and didn't find anything. Then at Hobby Lobby I did find some papers *okie so prefers HL over M's any day of the week*. I couldn't decide what color I should go with for the container. I first picked out some pink striped paper, and it was very pretty but I decided it might be too much pink. I then found some black and ivory paper but Linda and I decided the print was probably too big. So I settled on this smaller print of black and ivory. I used MS word to print the circle sentiment. The circles and scallop circle are done with paper punches. If you haven't seen it I did do a video tutorial on the sour cream containers and it can be found here -----> VIDEO TUTORIAL SOUR CREAM CONTAINERS. Perfect choice! I really like the paper! I've always wanted to try some?? Okie, I love them!!! They are too pretty!!! The smaller print worked out perfectly on these. Every time I see these containers I want to get a crimper! I'll bet the bride is going to really like them. I love the paper that you used for these. I love the choice of paper!! My question is what are they filled with?? I have a hard time deciding what to fill them with. Sharon in the past I have used M&M's but since this is for a wedding I used those butter mint things that you get at weddings and showers. Hobby Lobby had the candy on sale 50% off last week when I was there! BRAVO ... another gorgeous creation by the sour cream container MASTER! =) What a sweet gift to give to your co-worker ... she is going to be delighted by these special little treasures! I'm going to have to check out your video - these would be fun to make for my daughter's grad party next year. TFS! Love, love, love this. I have been looking for an "easy" treat bag. Doesn't get any easier! I watched your video... and what a great idea! Can't wait try it! I so love these little favors and so easy to make. Thanks for sharing. I'm gonna shock Okie by saying.... "I've NEVER Made these"!!! LOL I know whats wrong with me???? I will watch your tutorial and try and make some.... Yours looks great, I love the paper! :) Have a great day! Okie-I went out yesterday and got a paper crimper to make several of these containers. I bought the one made by Fiskars and it broke at the first twist. So I returned it to only have the same problem happen again!! What kind of paper crimper are you using? Also, are you using cardstock or just scrapbook paper? Kerri I am using a Marvy. A friend of mine wasn't using it so she sent it to me so have no idea where she got it. I only use scrapbook PAPER not cardstock or designer paper (ie Basic Grey, Bo Bunny, etc.) The paper that Hobby Lobby has in open stock is a good thickness. Any thicker and it doesn't seem to hold together well. I have also used paper from the DCWV 180 stack before and it does well. Loved this idea Okie! I made 40 for a wedding just in June. Although, I didn't use pattern paper, I simple used plain bright white cardstock ran it through the textile cuttlebug folder and distressed in the brides colors. They were beautiful. I made some of these filled with dark chocolate M&Ms for all of my co-workers at the end of a particularly difficult week. I handed them out at our staff meeting. I put a tag on them that send "open in case of emergency" (created on the computer & punched out like you did). Now I'm the official "maker of good things" @ work! I couldn't have done it without your video tutorial!